WRM is a mineral explorer and developer with two major 100%-owned projects on the go. 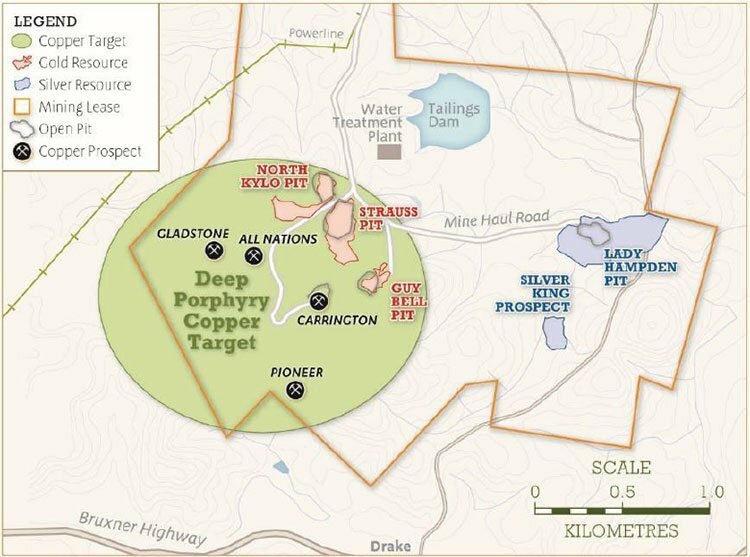 Its flagship project is the Mt Carrington gold-silver project in northern NSW, which is currently undergoing an optimisation study and PFS. Its second project is the newly acquired Red Mountain zinc-dominated volcanogenic massive sulphide (VMS) exploration project in Alaska. It’s an advanced VMS project, rich in high-grade zinc and silver deposits, which has already been identified as being of global significance, and with a further 30 look alike exploration targets for follow-up. Earlier this year WRM announced a high-grade 2012-JORC Mineral Resource Estimate at the Red Mountain Project, with some 9.1 million tonnes grading 12.9% zinc equivalent, this within a global Resource Estimate of 16.7 million tonnes at 8.9% zinc equivalent. 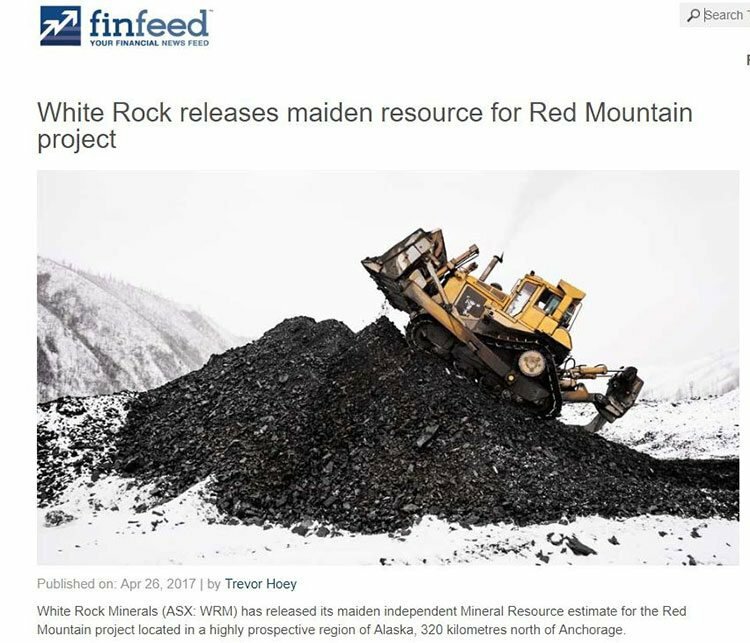 This resource estimate prompted Independent Investment Research (IIR) to publish a report on the company’s Red Mountain Project. Specifically, IIR determined that the project’s value was not being reflected in the company’s share price. It valued the project at between A$30 million and A$66 million, which corresponds to 6 cents per share. That compares to the minute A$1.2 million that WRM paid for the project in mid-2016. It should be noted here that broker projections and price targets are only estimates and may not be met and share trading patterns should not be used as the basis for an investment as they may or may not be replicated. Those considering this stock should seek independent financial advice. That report from IIR has now been followed up by a research report from stock broking firm DJ Carmichael. 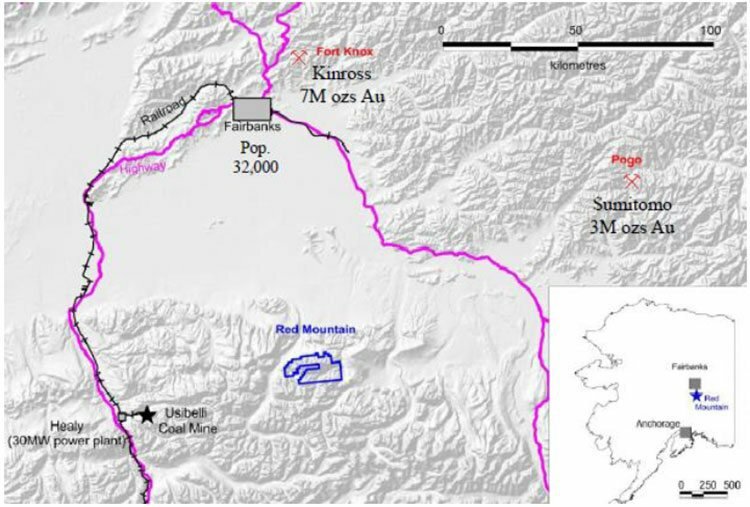 Its analysis covers both WRM’s Red Mountain Project in Alaska, plus its flagship Mt Carrington Project in NSW. 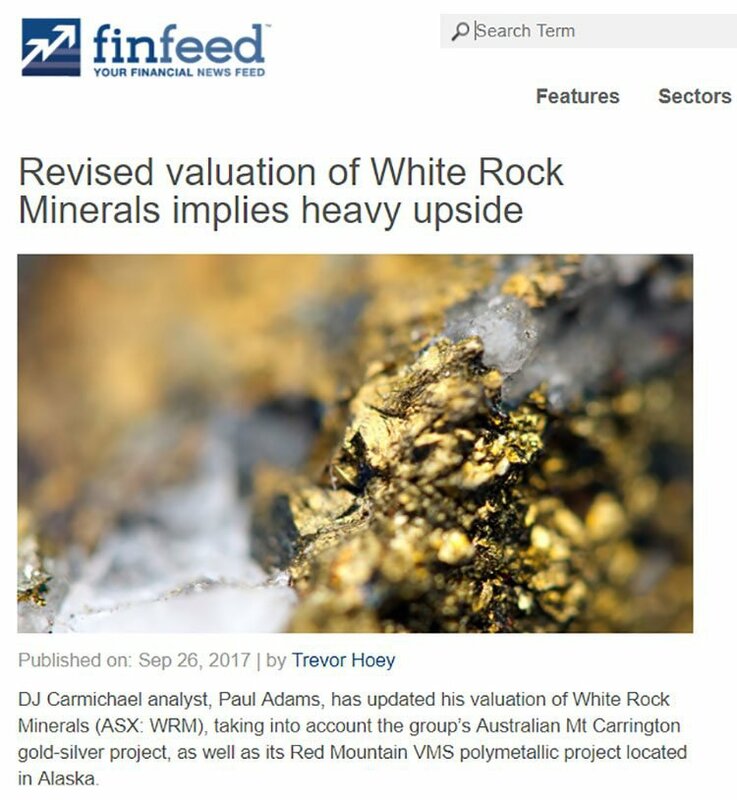 While WRM is flying under the radar at just 1.3 cents per share, DJ Carmichael has noted that there is significant value in the Red Mountain Project that is not reflected in the share price, having valued that project alone at 6 cents. The broker has also valued Mt Carrington at 1.9 cents per share and has an overall valuation on the company of 8 cents per share, including a 12-month target price of $0.04. It seems it may be just a matter of time before the market starts to catch on to the potential on offer from WRM. 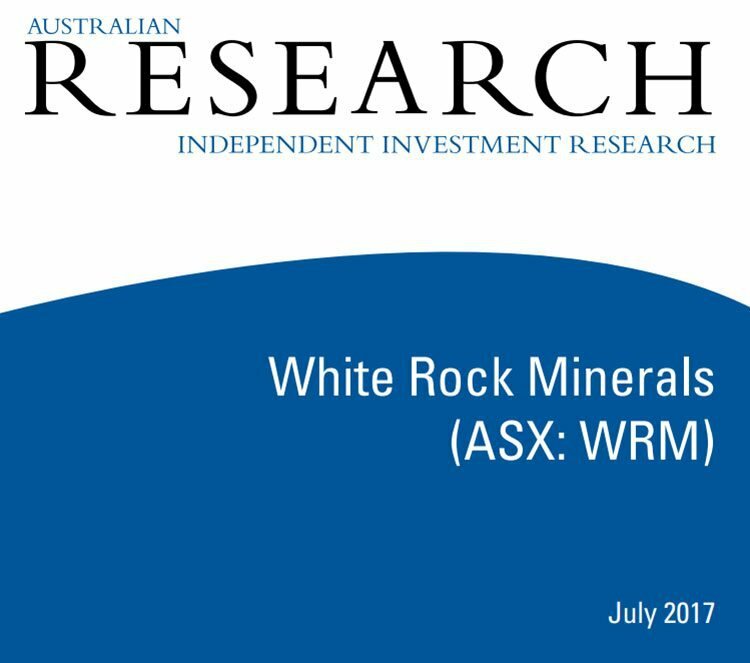 White Rock Minerals’ (ASX:WRM) two projects — Red Mountain and Mt Carrington — are each highly prospective, yet still underappreciated by the market. A fact that has now been backed up by two independent research groups. This podcast features Matt Gill talking in depth about the two projects and the opportunity to be part of a growing gold, silver and zinc company. Located 100 kilometres south of Fairbanks in Alaska is WRM’s recently acquired Red Mountain VMS Project. WRM holds 143 square kilometres of highly prospective ground in the Bonnifield Mining District with 224 mining claims that has seen no modern exploration. Since acquiring the original tenement package WRM has significantly added to it. The VMS mineralisation in the Bonnifield District is located in the western extension of the Yukon Tanana terrane. The district includes more than a dozen VMS prospects and several gold-quartz vein prospects which are largely under-explored. It is known to be prospective for zinc, lead, silver, gold, copper and uranium, but low metal prices in the 1990s forced explorers to abandon the field and shelve projects. WRM’s tenement package covers 30 look-a-like exploration targets in addition to the existing Dry Creek and West Tundra Flats deposits that were identified via conductive geophysics and geochemistry. The project is in the top quartile of undeveloped high-grade VMS deposits globally. It has one of the highest-grade VMS zinc-silver-lead-gold deposits out of its peers, and has 30 undrilled VMS targets still to be tested. In April this year, WRM released it maiden JORC 2012 Mineral Resource Estimate at the Red Mountain Project. Total inferred mineral resource of 16.7 million tonnes grading 8.9% zinc equivalent, containing a high grade resource of 9.1Mt grading 12.9% Zi-Eq. It has impressive base and precious metal content with 678,000t zinc, 286,000t lead, 53.5 million ounces of silver, and 352,000 ounces gold. This maiden resource immediately placed the Red Mountain Project in the top quartile of VMS projects globally and one the highest-grade projects of any company on the ASX. This maiden resource places Red Mountain on a par with projects such as Red River Resources’ (ASX:RVR) Thalanga Project in QLD and Heron Resource’s (ASX:HRR) Woodlawn Project in NSW, both of which are currently going into production. This resource placed the Red Mountain Project in the top quartile of VMS deposits globally and highlighted it as being one of the highest grade projects of any ASX-listed company. While the mineral resource placed Red Mountain in the top quartile of undeveloped high grade volcanogenic massive sulphide VMS (zinc, silver, lead, gold, copper) deposits globally, this could be just the tip of the iceberg at Red Mountain as the mineral resource encompasses only a small portion of the total tenement holding. VMS deposits tend to occur in clusters so it could be expected that the resource base could very well grow beyond its current 16.7Mt once it begins exploration on the look-a-like VMS targets in the tenement package. The Mt Carrington gold-silver project located 230 kilometres south of Brisbane in northern NSW is WRM’s flagship project. It has extensive mining infrastructure in place and drill ready exploration targets have been identified to expand the mine and extend the mine life. Mineralisation is typically hosted by sheeted to stockwork-style quartz veining, breccia fill and minor massive silicified zones with phyllic to silicic alteration. The majority of the mineralisation is associated with a 20km wide circular feature of low magnetic intensity called the Drake Quiet Zone, which has been interpreted as a large-scale caldera structure. 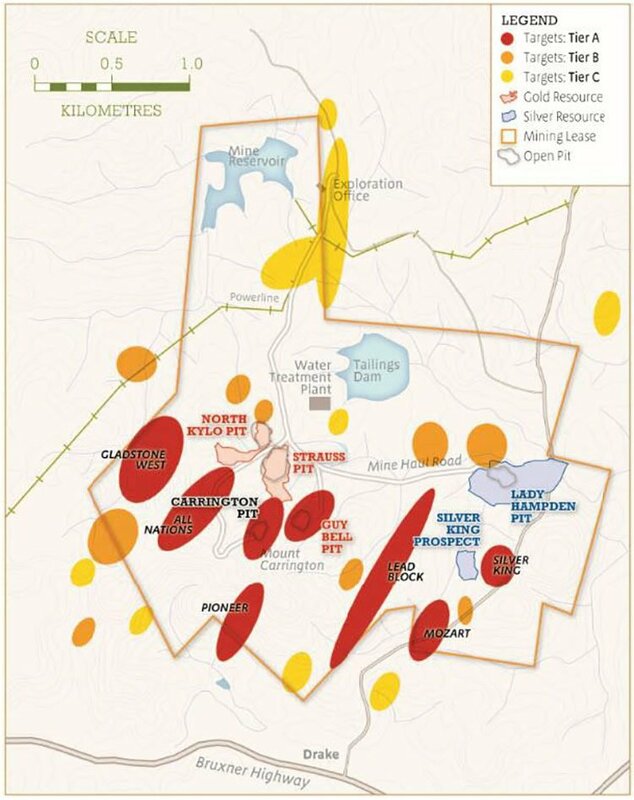 Mineral resources at Mt Carrington are contained within 8 separate deposits which are either gold or silver dominant. All are currently JORC 2004 but an upgrade to JORC 2012 resource standard is being undertaken as part of the on-going PFS / DFS. There are no ore reserves at this point in time, but it is expected there will be on completion of a successful PFS. There are four gold deposits, totalling 3.81Mt at 1.3g/t Au and 2.9g/t Ag and four silver deposits totalling 8.95Mt at 51g/t Ag and 0.1g/t Au. Combined, the resources total 338,000oz gold and 23.4Moz of silver. WRM is now optimising the current Scoping Study in order to derive a PFS which will help determine the overall scale of a development at Mt Carrington. Pit wall slope design in fresh material. With these two highly prospective projects on its books, a rerating of WRM could be a just matter of time. It valued Red Mountain at $52.9 million, equating to 6 cents per share. This suggests there is significant potential for future recognition by the market of the Red Mountain project’s value. 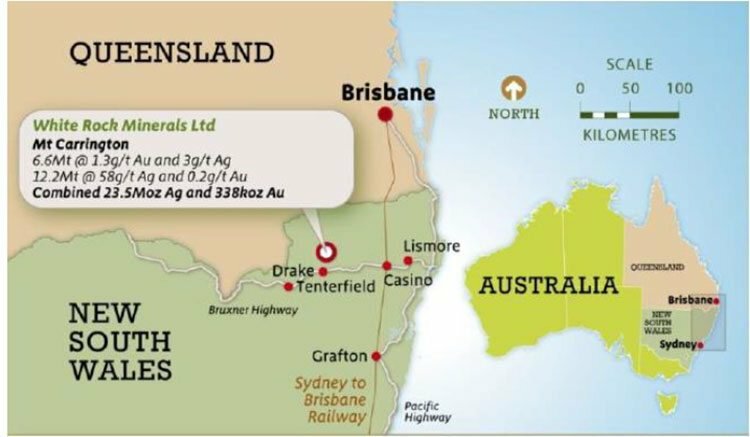 In determining a valuation for the Mt Carrington project, the broker used two valuation methodologies — recent M&A transactional analysis of Australian-based gold deposits and a peer group analysis based on enterprise value (EV) per resource ounce gold equivalent. The transaction based valuation arrived at a $17.2 million figure for Mt Carrington, based on an average gold price of $26.70 per oz. 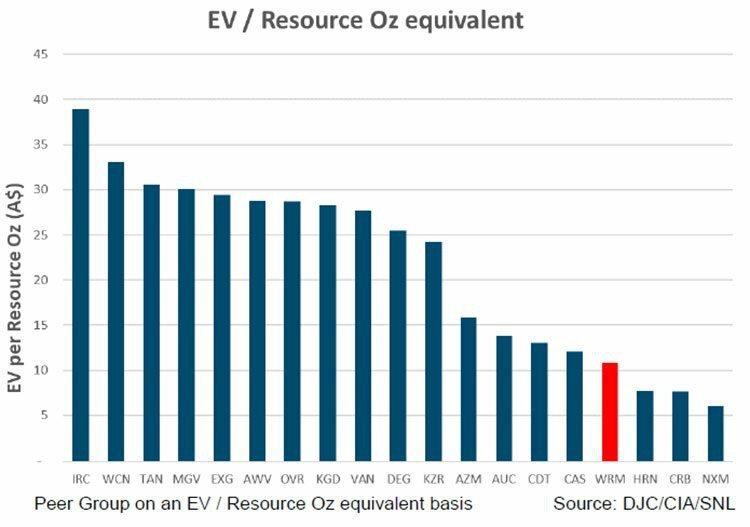 The peer group comparison on EV/Resource Oz equivalent valued the project at $17.4 million. 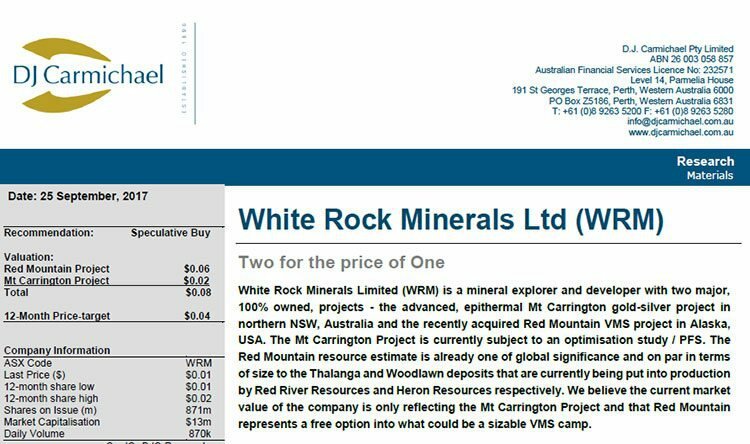 The broker found that each of the comparative projects to Mt Carrington have greater valuations, suggesting that WRM is undervalued. That’s even when (the already mentioned) considerable valued of the Red Mountain project is ignored. These two valuation methods resulted in an average valuation of $17.3 million for the Mt Carrington Project, or 1.9 cents per share. Keep in mind that the current WRM share price is just 1.3 cents. The market is clearly not yet assigning any value to Red Mountain, and even the Mt Carrington valuation of 1.9 cents per share exceeded the current WRM share price. For this reason is has a 4 cent per share 12-month price target on the stock, compared to an overall valuation for WRM of 8 cents per share. More detailed explanation of how these valuations were calculated can be found in the DJ Carmichael report . IIR, a research house operating in Australia and the US, published a report on the company in July after the release of WRM’s initial Mineral Resource Estimate at Red Mountain. WRM’s strategic acquisition of Red Mountain last year for just A$1.2 million lifted the company’s valuation and positioning among its peers. IIR’s valuation of the Red Mountain project comes in well above what the company paid for it, at $30 to $66 million. Like DJ Carmichael’s Red Mountain valuation, that translates to a value of 6 cents per share (with a range from $0.034/share to $0.076/share), compared to the current share price of 1.3 cents. Note that this valuation is just for WRM’s Red Mountain asset, not the entire company. It doesn’t take into account WRM’s 338,000 ounces of gold and 23 million ounces of silver at Mt Carrington, which offers excellent exposure to the Aussie dollar gold price, plus silver and zinc upside. IIR’s valuation of the project implies an approximate four-fold premium to the company’s current share price, even before any value from its Mt Carrington gold and silver asset is accounted for. Again, it should be noted that broker projections and price targets are only estimates and may not be met. Those considering this stock should seek independent financial advice. A key positive driver for WRM is the soaring price of zinc, in conjunction with declining forecasted mine production. 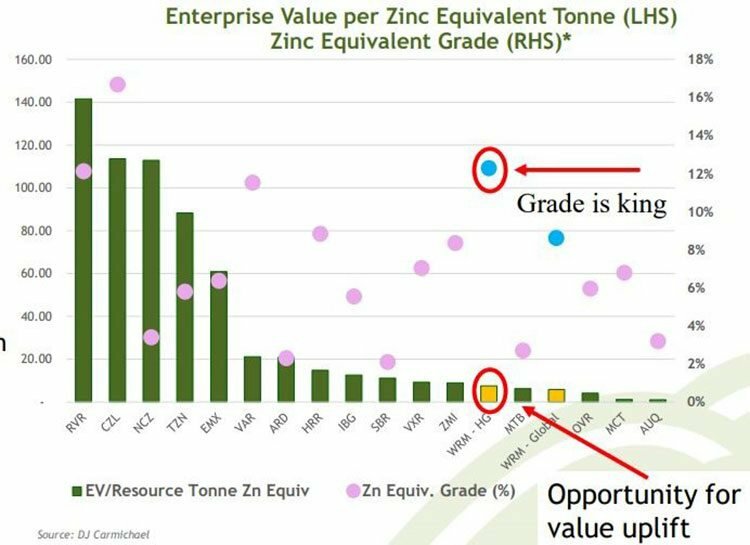 This outperformance is due to the fact that investment in exploration and development over the last few years had been held back due to historically low zinc prices forcing the closure of several operating zinc mines. As demand for zinc grew in line with industrial growth, particularly in China, warehouse stocks have fallen and prices have risen. Demand is expected to continue rising over coming years, placing pressure on global stocks and further supporting the zinc price. There are signs that there will be a global supply deficit through to 2020. Red Mountain’s significant value and resources do not seem to be fully captured in WRM’s current share price and enterprise value... this has now been backed up by two independent research groups. Both groups value the Red Mountain project at $52 million, or the equivalent of 6 cents per share. They see last year’s Red Mountain acquisition having not been recognised whatsoever by investors. On top of that, DJ Carmichael value the Mt Carrington Project at $17.3 million, or 1.9 cents per share. The broker has also valued the whole company at 8 cents per share, with a 4 cent per share 12-month price target. At the current share price of 1.3 cents per share, the company appears significantly undervalued, even when compared to each of the two projects individually. DJ Carmichael’s and IRR’s valuations appears to be supported by HSBC (with a 15.5% interest in WRM), Citicorp (with a 7.9% interest) and several other major shareholders, which have already identified the value of the project and jumped in. 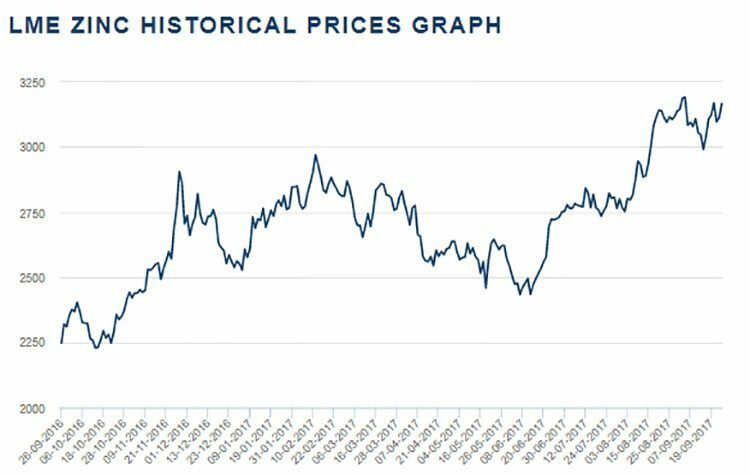 Supported by rising zinc prices, now could be a good time for new investors to take note — before the market picks up on the value on offer.